The Ford Fairlane was a model that was made in the United States from 1955 to 1969. The car was named after the estate where Henry Ford lived, which is located near Dearborn, Michigan. After some time, the car's name described a variety of cars in various classes. Overall, there were seven generations of Ford Fairlane models made. 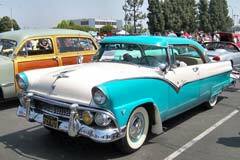 The Fairlane was originally an automobile that was full-size and had either a V-8 or straight-6 engine. From 1960 to 1962, it was produced as a mid-size vehicle. These models had the first small-size block V-8 engine that Ford ever built. In 1966, the Fairlanes were larger and had a new body style. The convertible Fairlane was once again available in GT, GTA, 500 and 500XL models. The 1968-1969 Fairlanes had a totally new body style. Based on the model, they were either called a Fairlane or Torino but they still had the same body style. The lower-end to mid-range models were called Fairlanes, while the more expensive GT models were called the Torino GT. In 1969, the Fairlane Cobra was introduced and its standard equipment was the 4-speed floor shifter, bucket seats, performance suspension and the 428 Cobra engine. Today, this model is a favorite of Fairlane collectors.